Your customers now expect the Uber experience – great service, real time updates and easy ways to pay. The Zoom Passenger App makes it really simple for passengers to book a journey with you. They just download the app and then can book a car with just two taps, for a journey now or later. The app gives them an expected time of arrival, and they can follow the car’s progress both in the app or via text messaging, all in real time. And because we take care of all the branding and maintenance, there’s no extra cost to you. 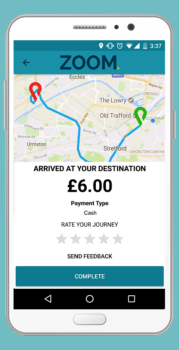 Once the journey is complete, you can pay directly from the app (once you have registered your card details), and rate your driver. The Zoom Passenger App, plus text messaging and voice integration, is all available for a small fee. So test drive Zoom yourself – start your 6 week FREE trial today. 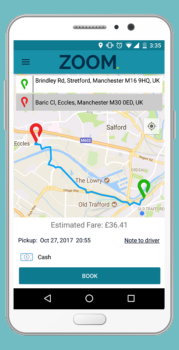 You want the full taxi app experience – with easy bookings, real time updates and the chance to rate a driver. Zoom delivers every time. You expect to be able to book quickly and easily over the phone, web or an app. Plus you want to track the driver’s location, and check them out before you arrive. And last but not least, you want to be able to pay easily and share your experience with others. Zoom does all of this, and more. Can passengers book journeys for now and later? Yes. With a simple extra tap of their finger, passengers can choose a date and time in the future for which to book. In what different ways can customers pay for their journeys? Zoom allows flexibility when it comes to customer payments. They can pay by cash or card, and accounts can also be set up with options such as credit limits. Will customers receive details of their driver? Once the driver has accepted a passenger’s fare, the passenger will be able to see all the details of the driver, vehicle, registration plate and rating. From there they will also be able to call the driver with one tap of a button if he/she has not arrived yet. What should a potential customer do to start using the app? Customers simply have to download the app from the iOS or Android store, then signup. After this they will be able to book jobs to their hearts content!